Imagine being curled up by a fireplace, mug of tea in hand, looking out through floor-to-ceiling windows at the crashing, turning, pushing waves. Imagine the smell of baking cinnamon rolls and fresh coffee as your invitation to begin your day. Imagine sitting beside someone who is quickly becoming a friend as you each share your creative dreams and brainstorm how to live them into reality. Imagine the gift of time alone to spend in whatever way you choose without any expectation of what you need to do next. Imagine getting out of your "writing" headspace and walking on the beach to gather shells or playing with paper and glue and color or simply sitting in the quiet remembering yourself. Imagine finding your way to laughter and silliness and the decision that staying in pajamas all day is the perfect one for you. Imagine having the space to simply listen to what you most need and then realizing that you are surrounded by people who will support you as you make it happen. This is the Pen & Paper Retreat. This is a place where you can just show up, and you will be given the gift of time to rest and recharge so you can find your way back to you. This is your invitation to come and be with other people who are drawn to sharing who they are through the written word. What will we do at this retreat? Each day we will spend a few hours in community where the mentors for this retreat will lead the group in discussions, writing prompts, and other experiential exercises. Each day there will also be an optional meditation-inspired activity led by me (for example, this might mean an early morning beach walk or a senses writing meditation), and each evening there will be an optional group activity. There will be lots of time during the day for participants to work on their own writing or gather in small groups or walk on the beach or take a nap or go into town and shop...and so on. There will be snacks available throughout the day so that participants can feel nurtured as they work, play, rest, and recharge. Also, an "art space" will be available throughout the retreat where participants can spend time collaging or finding words in magazines and books or working in art journals and so on. 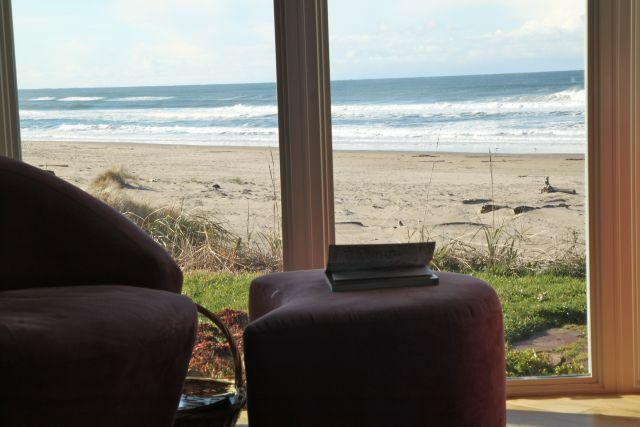 Why should I come to the Oregon Coast in February? Because when we give ourselves the gift of time away from our daily lives so that we can be present to our whispered dreams, it should be in a place that is gorgeous and sparkles and is full of magic. And, to put it simply, the Oregon Coast is magic. And yes, we might have rain or even a dusting of snow, but we will be cocooned inside together and the views will still take your breath away. In late February, we also might have sun and temperatures warm enough to go outside in just sweaters. And I can promise that flowers will be blooming. Flowers. Blooming. In February. Magic. Even though I write on my blog and in my journal, I don't consider myself a writer. Is this retreat for me? I don't have a current writing project but I feel called to this retreat. What should I work on if I come? See above. Also, feel free to email me (Liz) and I will help you hone in on what you might want to bring to this retreat. I'm an art journaler. Can I come? Oh my goodness yes! I would love for you to come and share this beautiful writing tool with others. You will have time and space to art journal if you choose. And you will be given new tools that you can use to further explore and add to your art journaling.